Amrit Kalash - a Superstar! 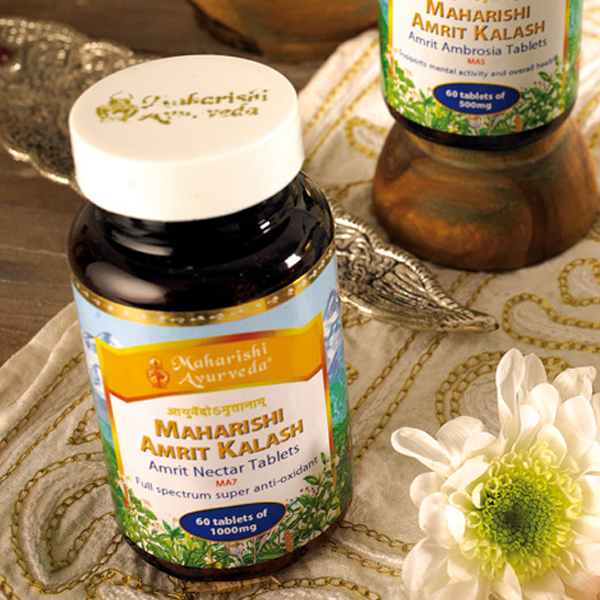 When Maharishi Mahesh Yogi the founder of Maharishi Ayurveda released Amrit Kalash to the World he was so moved at its power to promote wellbeing that he called it the 'Nectar of Immortality'. Amrit Kalash is a two-part formula - Nectar and Ambrosia. Both formulae have a long and fascinating history. Taken together they enliven the underlying intelligence in the mind and body and produce widespread and synergistic health promoting effects. 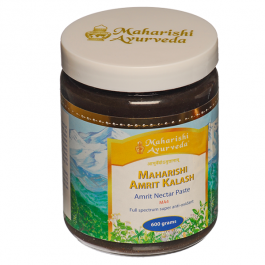 The Amrit Kalash Nectar has a particularly strengthening and balancing effect on the heart, mind and immune system. 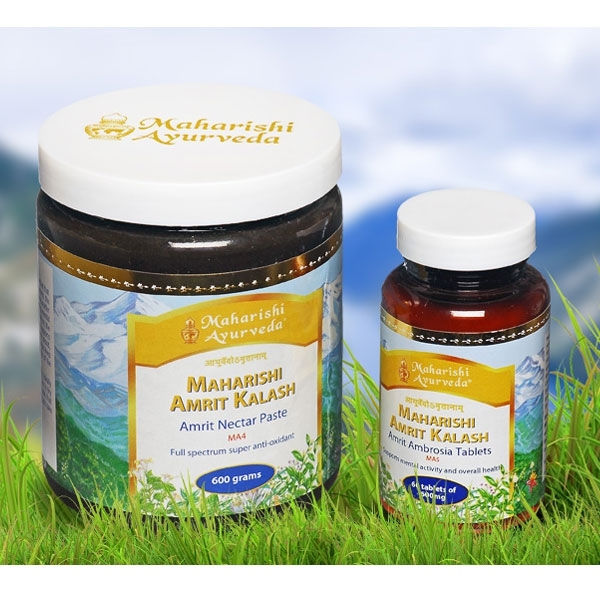 While the Amrit Kalash Ambrosia especially supports the function of nervous system and mind producing refined awareness, creativity, mental balance and happiness. The two Amrit Kalash formulae belongs to the category of herbals in Ayurveda called Rasayana. A Rasayana supports the mind and body at its deepest essential level. Herbal supplements have to be true superstars to be qualified as rasayanas in Ayurveda. The Amrit Nectar formula is prepared in the traditional way handed down from generation to generation of Ayurvedic physicians. In 250 meticulous steps, whole herbs are prepared and combined in precise proportions. The synergy creates a whole that is greater than the sum of its parts. Twenty two pounds of raw ingredients are used to produce each jar of the Amrit Nectar formula. The herbs are slow-cooked to protect vital nutrients from high temperatures. 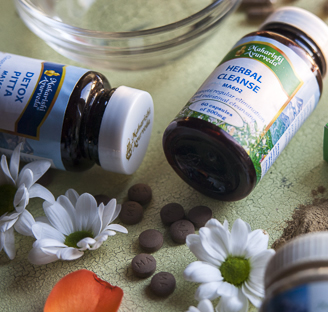 This attention to detail ensures that you receive a perfectly prepared herbal nourishment for the mind and body. People who take Amrit Kalash report that they feel happier, are more resilient to stress, feel more alert with improved creativity and less fatigue. In addition they report that they have more energy and feel greater inner calm. Would you like some too? Dr Hari Sharma, M.D., Professor Emeritus and Former Director of Cancer Prevention and Natural Products Research, The Ohio State University College of Medicine said "When the results of these studies first came in I added Amrit Kalash to my own diet. There is little precedent for single substances that produce such profound and wide-reaching effects." Withania somnifera or Winter Cherry helps balance Vata and Kapha and nourishes muscle, fat, bone, bone marrow/nerves and the reproductive system tissues. It is traditionally used to help inhibit aging and is one of the best herbals for the mind helping to increase clarity and reduce the impact of stress. Glycyrrhiza glabra or Liquorice helps to balance Vata and Pitta, rejuvenate all seven tissues and has a beneficial effect on the stomach, intestines, liver, brain, heart and blood vessels especially when used in combination with the other herbals in this formula. It is traditionally used as a tonic to support nerves, eye function, immunity, mental and emotional balance and memory. Ipomoea digitate or Giant Potato helps balance Vata and Pitta. It is a general tonic that nourishes all the seven tissue layers and has a beneficial effect on digestion, excretory system, nervous, reproductive and respiratory systems. Traditionally it is used as a heart tonic, to nourish the brain, and to help cleanse the lungs and the digestive system. Asparagus adscendens or Safed musali helps to balance Pitta and Vata. It supports all major body systems especially the circulatory, digestive, reproductive and respiratory systems. It is a tonic for the immune system and particularly helps keep the membranes of kidneys, lungs, sexual organs and stomach healthy. Phyllanthus emblica or Amalaki is a 'wonder herb' as it balances all doshas with a special emphasis on Pitta dosha. It has a nourishing effect on all seven tissues, especially blood and muscle. 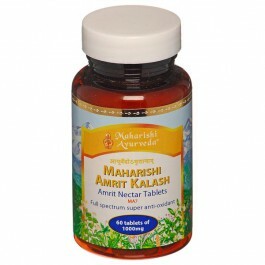 Amalaki increases Ojas which supports immunity, stability of mind and body and long life. It has a sattvic or 'pure' quality which promotes love, longevity and good fortune. It helps to calm and balance emotions and gives a sense of reassurance. 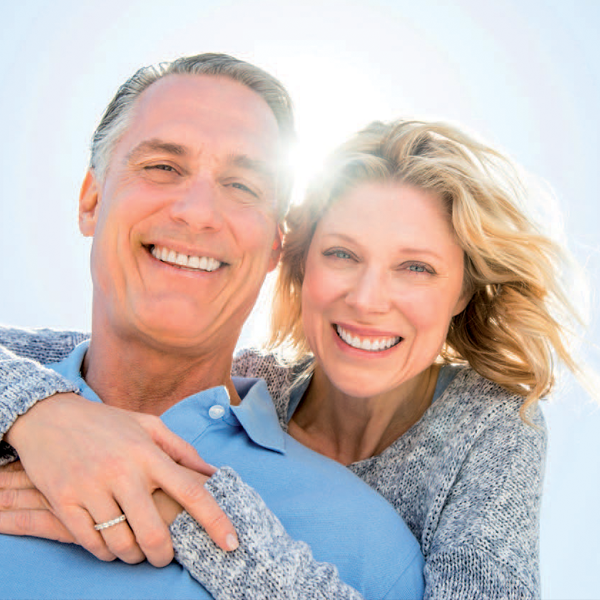 It also supports gut health by balancing the delicate intestinal mucous membrane essential for good nutrient assimilation. It is one of the highest natural sources of Vitamin C.
Terminalia chebula or Haritaki balances all the doshas and nourishes all the tissues. It supports the healthy function of the digestive, excretory, nervous and respiratory systems. Haritaki is a rejuvenative herb that supports the liver, blood, throat, mouth, gums, muscles, heart, skin, nervous disorders, feeds the brain and nerves. It helps to give pure awareness so is sought after by those who meditate to support higher states of consciousness. 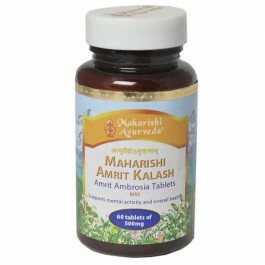 The principle herbs of the Amrit Kalash formulae have very broad health benefits. The supporting herbs add balance and depth to the effects to make two special formulae. So if you are wanting a holistic formulation to help support all levels of your mind and body consider making Amrit Kalash Nectar and Ambrosia part of your everyday health promotion and prevention regimen. They deserve their status as the 'Nectar of Immortality'. 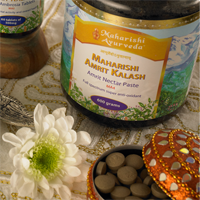 MAK Ambrosia is one of Ayurveda's most powerful rasayanas (rejuvenators), promoting vitality and strength in both mind and body. 13 whole rare herbs and fruits are combined in precise proportions to creating a synergy that is greater than the sum of its parts. It has been designed to promote the optimum functioning of mind, brain and nerves. MAK Ambrosia boost mental potential and enhances three types of mental function: acquisition, retention, and recall of information. This all-natural, pesticide-free blend is said to promote Ojas, the finest body tissue and traditionally seen as central to long life and perfect health. Contents 60 tablets 30g or about 30 days supply. Children up to 2 years - 1/4 adult dose; 2-4 years - 1/2 adult dose; 5 or more years - adult dose. May be taken continuously for maximum benefit.